Pac-Man may not be the best role model for people trying to lose weight, but the principles of videogames in general can work pretty well. Seventeen-year old Taylor LeBaron was sick of being overweight, so he stuck to a plan of action that included his self-created "Ultimate Fitness Game." This is not an actual videogame, but a method based on videogame principles that was part of the reason LeBaron was able to lose 150 pounds. Last week on the Today show, LeBaron told Meredith Vieira: "[The Ultimate Fitness Game] has the same aspects of a video game. You have enemies, you have allies, and you have money. You have to play smart; otherwise, you run out of your money. Your score needs to be high at the end of the day." In the game, LeBaron equates calories to money, making them "easier to keep track of and more fun and engaging." He thought of his day as a "maze of rooms" that he had to get through, where objects like cookies would cost him 200 points. Transferring the task of weight loss into "bite sizes that are achievable" is what helped LeBaron be successful. Farming up the best loot in World of Warcraft often requires just as much dedication and endurance as getting out to the gym and avoiding the temptation of Ho Hos. When the fun of a game was added, it helped to keep LeBaron on track. His mother also lost 75 pounds with the game, while his grandmother lost 45. 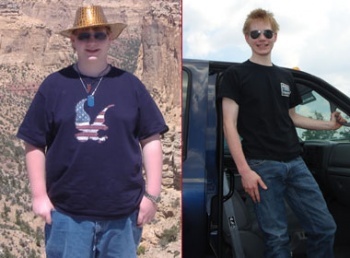 He wrote a book about the whole experience called Cutting Myself in Half: 150 Pounds Lost One Byte at a Time. There's something to be said for LeBaron's game as a valid method for losing weight. Often, the problem with working out and eating right is the lack of immediate results. When turned into a game, there are results every day that can be added up and followed, just like an experience point bar. Along with MC Frontalot's method to quit smoking, it looks like games could be the solution to all of the world's ills.